Provide comfort for the family of Violet Bowman with a meaningful gesture of sympathy. 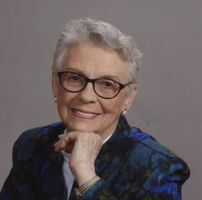 Violet Bowman passed away on Wednesday, January 23, 2019 with the care and comfort of her sons, grandchildren and friends. She was born on August 30th, 1931 in Chicago to Max and Edna Mehmen. Being raised during the depression and an only child, her small extended family was very important to her. After completing high school and going to one year of college she enlisted in the United States Marine Corps and after boot camp, found herself in Camp Pendleton, California at supply school. During her 2 plus years in the Marine Corps she met fellow Marine Wilbur Edward Bowman (Web.) They married in February of 1952. Web was soon deployed to Korea. She was honorably discharged in June of that year. She went back to Chicago and in November her oldest son, Rex was born. When Web returned from Korea they were off to his new assignment in Hawaii. There her second son Gary was born in 1954. Different orders took them different places . . . back to California and then Ogden Utah. In 1958, their youngest son Glenn arrived. Two more orders took them back to California and then to Rockford IL. It was here in 1967 that Web retired from the service and moved his family to Montana, where family vacations prior to his discharge were spent because of Montana open spaces and hunting and fishing. Web did various things while Vi started her career in banking at First National Bank, now First Interstate Bank. It is here where she met her forever friends Maxine Eliason, Delores Criswell, Sue O’Neil and Linda McCarthy. Even after she retired in 1994 and lost Web in 1997, she could be seen every Wednesday downtown patronizing local eateries with her forever friends. She was a member of the First Presbyterian Church in Missoula and active with the Presbyterian Women. She enjoyed attending many events that involved her boys and her grandchildren. She loved not only being a mother and grandmother, but loved being entertained. Survivors include Rex Bowman; Julie Sturm and their children Wesley, Alicia and Jarrett; son Gary; son Glenn and wife Renee Sperry Bowman and children Trevor, Christopher, Tenaya (Josh Pederson), Bridon, Bryce, Chance, Creston and Teneka. She was thrilled with her great grandchild, Kole Bowman-Pederson. To send flowers in memory of Violet Bowman, please visit our Heartfelt Sympathies Store. 235 S Fifth St W.
Provide comfort for the family of Violet Bowman by sending flowers.